With the nation on high alert following last week’s school shooting in Parkland, Florida, Harvard-Westlake High School in Los Angeles was shut down on Friday morning due to a threat allegedly received from former student, and NFL offensive lineman, Jonathan Martin. 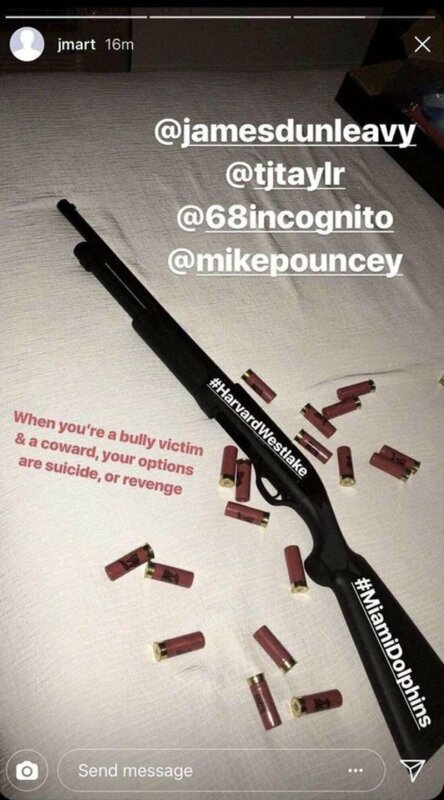 Martin, who is best know for being subjected to bullying while with the Dolphins, allegedly posted a cryptic message to his Instagram account last night that included images of a shotgun, shells, and the hashtags #Harvard-Westlake and #MiamiDolphins written across the barrel. It also tagged former Dolphins teammates, including Richie Incognito and Mike Pouncey, who were implicated in his bullying. In the past, Martin has also detailed accounts of being bullied in high school. While officials from Harvard-Westlake will only confirm that the the closure was caused by a social media threat from a former student, the Los Angeles Times has confirmed it was caused by Martin’s post. TMZ is reporting that Martin has been detained by the L.A.P.D for questioning regarding the incident.